In both the United States and the United Kingdom, conservative and libertarian viewpoints have endured censorship on the Internet and on college campuses. This has given rise to a new generation of animated and impassioned students keen on partaking in what’s been aptly described as the “cultural libertarian” movement. Young millennials engaged in this movement come from a variety of backgrounds but are able to unite based on a fervent disdain for those that believe there are boundaries to what’s deemed “acceptable” speech—a hatred of authority; and a love of freedom and mischief. As a conservative writer and student at King’s College London, I have been actively campaigning against political correctness. I was recently temporarily suspended from Facebook for announcing a series of speeches I wanted to give at universities in London questioning the place of Islam in the modern world. I believe social media companies like Twitter and Facebook actively seek to censor those who talk about the link between Islam and the behavior of jihadists, those who want to put a halt to immigration and those who criticize the Black Lives Matter and feminist movements. The victims of their failure to entertain nuance are solely of one political persuasion. My public support of Donald Trump at college was an exercise in differentiating between those who cared about freedom of expression and those who were willing to discard it in favor of a feeling-based approach to learning. I think being provocative and adopting a contrarian-like demeanor to intellectual discourse is mistakenly associated with populism and a lack of integrity in our culture. Pushing the boundaries is an integral part of upholding the pillars that help maintain a healthy civilization—so long as my university infantilizes students by no- platforming politicians like Boris Johnson, condones the harassment of those who support the Israeli state, and perpetuates the idea that safe spaces are necessary. I will continue to make my voice heard. As a free-speech activist, journalist and student. I felt obliged to join the fight to reinstate Milo Yiannopoulos after his permanent ban from Twitter. I did this by highlighting the partiality of his ban and seeking support from others through keeping the “FreeMilo” hashtag alive. This resulted in me being harassed and receiving death threats from accounts that were reported by dozens of people yet escaped suspension. As reported by Heat Street, shortly after Yiannopoulos’ ban, I sought to reveal the implicit bias of political correctness on Twitter by re-posting the hateful tweets by Leslie Jones, the actress from the new Ghostbusters who is credited with getting Yiannopoulos suspended. Twitter temporarily suspended me within hours, and decided to take no action against Jones. Both Harith and I are students at overwhelmingly liberal schools, and we’ve encountered professors and students who dismiss our opinions by virtue of our political affiliation. The majority of lecturers and academics view the world through the prism of one ideology. I remain hopeful that universities will eventually begin to promote intellectual diversity. The increased presence of organizations supporting conservative and libertarian students such as Right2Debate, Leadership Institute, Young Americans for Freedom and Young Americans for Liberty will act as a voice for those students facing discrimination. By having these organizations offer training, conferences and financial support, students are now equipped to challenge the misrepresentations by the left. I carried out a social experiment last semester at my school, Mount Holyoke College, that showed how much freedom of speech has diminished as a principle worth defending by young students on the left. I hung a Trump campaign sign on my door, it was thrown into the garbage bin. After hanging the Trump sign back up, it was yet again thrown in the garbage, but this time ripped to shreds. This illustrated not only the deep political divide on my campus, but the reactionary and juvenile behavior of my fellow students. Uniting to give a voice to those students facing censorship or discrimination for holding respectable views is the way forward. The internet remains a place where young “cultural libertarians” have a chance to speak out against the hypocrisy of the left. News websites (including Heat Street) have provided us with the opportunity to expose the way in which freedom of expression has been curtailed to appease the liberal-majority. We both realize that university administrations cave to the will of those who are most organized. This is what gives us both hope and encouragement. Conservatives and libertarians need to unite to win this culture war. We vow to do all we can to challenge the authoritarians at universities in the UK and USA. If we continue fighting, we’ll eventually become the majority. History testifies that freedom always prevails. Libertarianism is a meme by Ayn Rand to defunctionalize white racial consciousness. I have never met a Libertarian who will read and face the facts in the article A Sense of Life: Ayn Rand by Gregory Hood (first appeared in Kevin MacDonald’s The Occidental Quarterly). 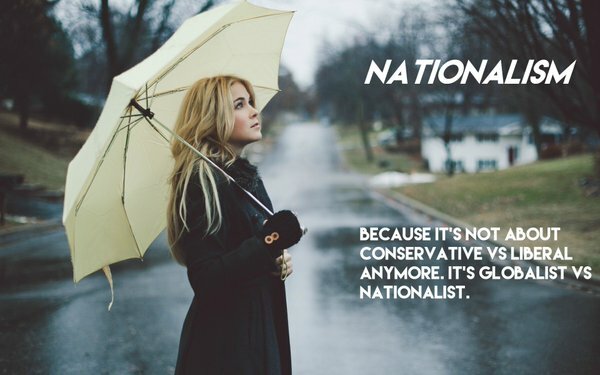 I refer people to Why I Left The Libertarians Behind (And You Should Too) by John Amery on Traditional Youth Network, also my comment.